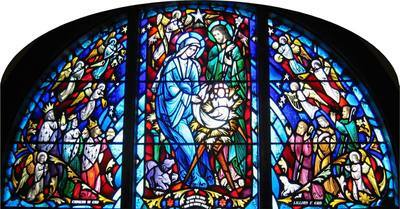 The Lunette Window (The Birth of Jesus) This window, depicting the birth of Jesus, was dedicated on Christmas Eve, 1971. 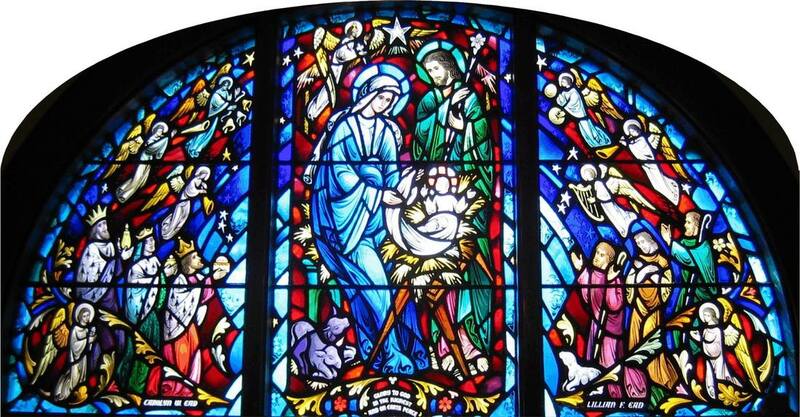 "Glory to God in the highest and on Earth Peace." is inscribed at the bottom of the center panel. It was given by Edwina Robinson in loving memory of Carolyn W. Ead and Lillian F. Ead. 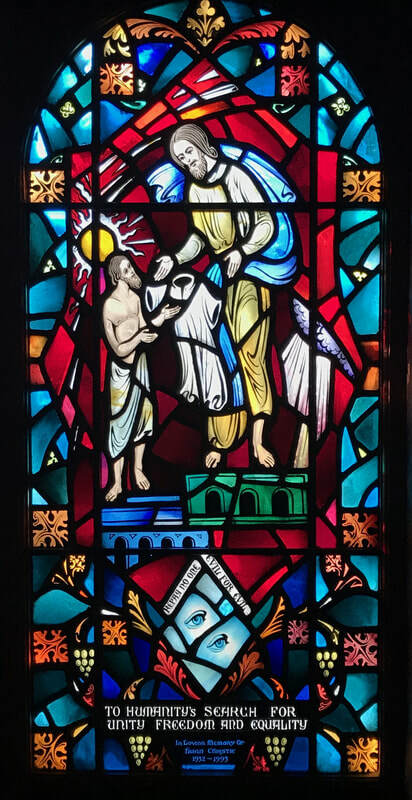 Vestibule (narthex) South Window (We are Laborers with God) In this window, there are two small personal symbols, the rainbow and the Masonic emblem. 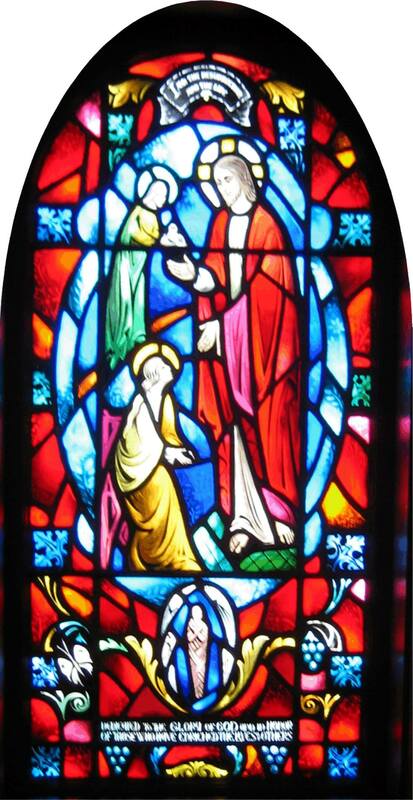 Jesus is shown as a carpenter. Also depicted are a tent marker, a spinner, a women cooking, a farmer and a fisherman. 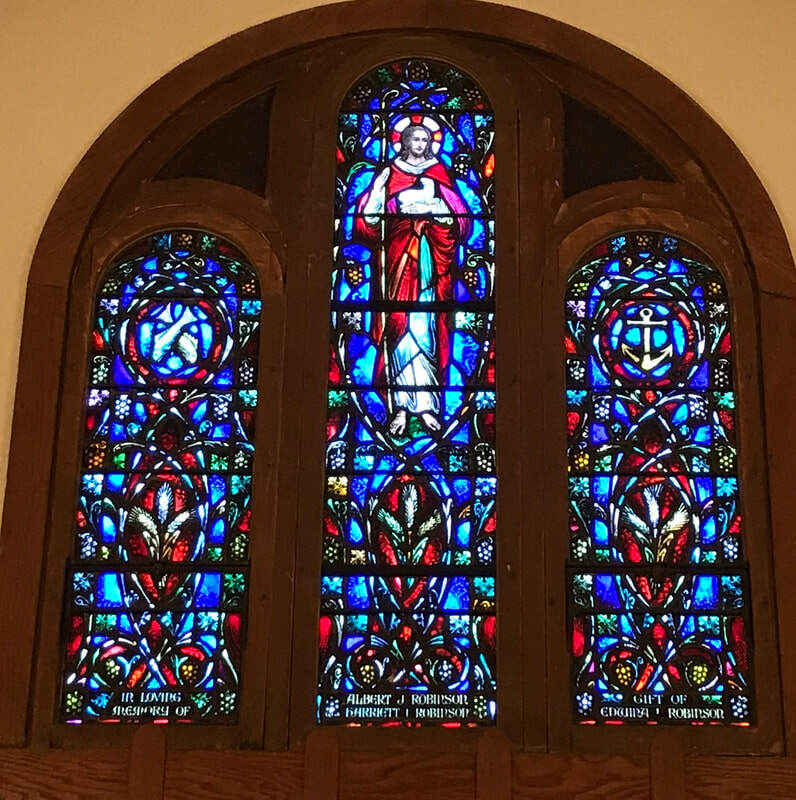 The window is given by the Koehler Family in memory of Harry and Louise Koehler. Single Aisle South (Jesus in the Temple) The single aisle window on the South side of the sanctuary is devoted to the young Jesus in the temple at Jerusalem, at the age of 12, when he was talking with elders. Below is depicted the lamp of learning and enlightenment. The border is a grapevine, symbolizing the fruitfulness of the Church. At the base is the inscription: In loving memory of Randal Coombs. 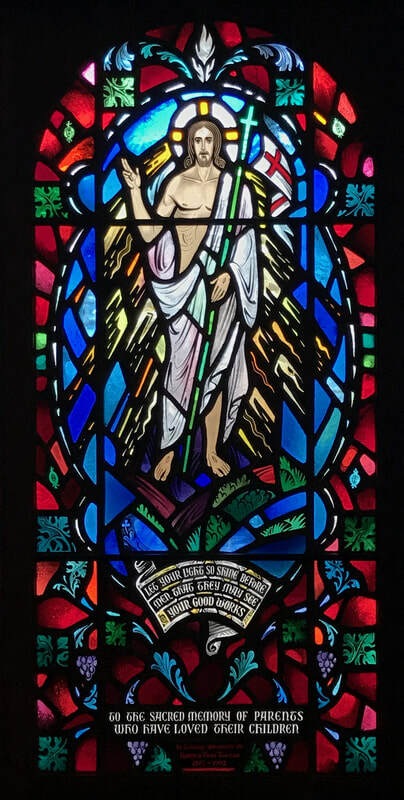 Single Aisle North (I am the Resurrection and the Life} The single aisle window on the North side of the sanctuary is based on the scripture: "I am the Resurrection and the Life." It depicts Jesus with Mary and Martha, after the death of their brother, Lazarus. Its dedicated "To the Glory of God and in honor of those who have enriched the lives of others. South Stairway Window (Let the Children come to Me) This window depicts Jesus with the children, with the passage "Let the children come to me." Flowers and birds symbolize the joy and beauty of nature. Given in honor of Parmenter and Mabel Brummitt, gift of Gloria M. Brummitt and in honor of Gloria Brummitt by her friends. Aisle Window North Earth from Space: A new way of seeing our place in the universe. "Then I saw a new heaven and a new earth." Given by the Corea Family and dedicated "To those who have inherited eternal life." Aisle Window North Jesus, Light of the World, still lives in the hearts of his followers. "Let your light so shine before men that they may see your good works." Dedicated "To the sacred memory of parents who have loved their children." In loving memory of Harold (Pete) Little. 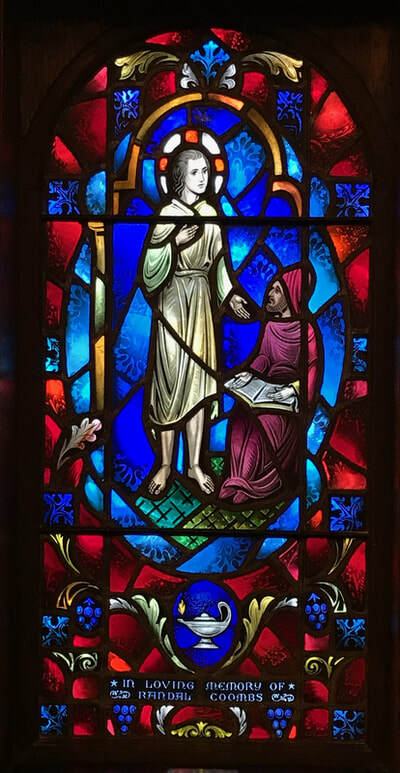 Aisle Window North Jesus praying in Gethsemane "To the God of Love and Beauty." In loving memory of Pietro, Caterina, and Mary Corea, by the Corea Family. Aisle Window South "The Sermon on the Mount" window depicts Jesus as he talks with the crowds by the Sea of Galilee. "Seek first the Kingdom of God and His righteousness." In loving memory of Walter Stewart, by his family. Aisle Window South "The Prodigal Son" window depicts the father welcoming home his long lost son with open arms while his second son looks on from his work in the field. The fatted calf is above the inscription: Given in honor of Jen Taylor, by her friends. Aisle Window South "The Parable of the Good Samaritan" shows the Priest, the Levite and two others walking past a beaten man. The Samaritan stops, takes pity, and cares for the man. A Church is above the inscription: "In loving memory of Vivian and George and Rose Christie. Aisle Window South Paul writing his first letter to the Corinthians: "Though I speak with the tongues of men and of angels and have not charity, I am become as sounding brass" is inscribed in the rays above the seated Paul. "Faith, Hope, Love; the greatest is Love" is inscribed at his feet. The window is: Lovingly dedicated to our children and our parents, a gift of Dorothy and Harold Sparks. The Chancel Window Jesus as the Good Shepherd is in the center panel. The panel on the South side is the anchor cross of hope and faith. The panel on the North side is fishes, an early Christian symbol, used to avoid detection by the Roman soldiers but indicating Christian allegiance to other followers of Jesus. The border is made of grape vine and wheat, symbols of the Last Supper, observed now in Holy Communion. The Window is given by Edwina Robinson in memory of her parents. 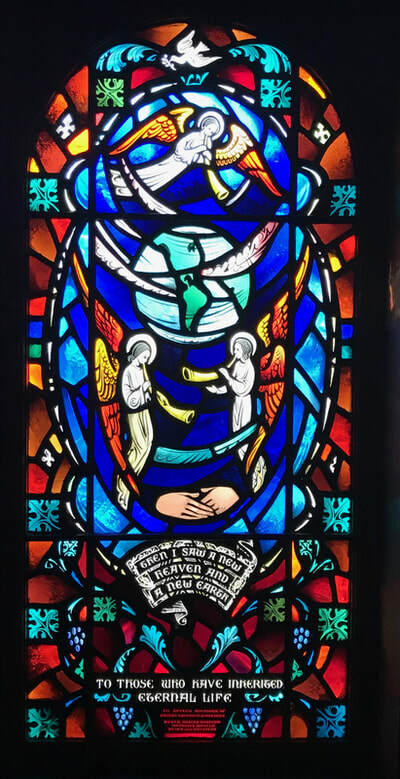 The Balcony Window "Immortal Love, Forever Full" shows the heart of Jesus and two angels resting on two figures representing Peter and Alicia. Given in Honor of Dr. Peter V. Corea and Rev. M. Alicia Corea for 25 years of devoted service. From the Houghs Neck Congregational Church.